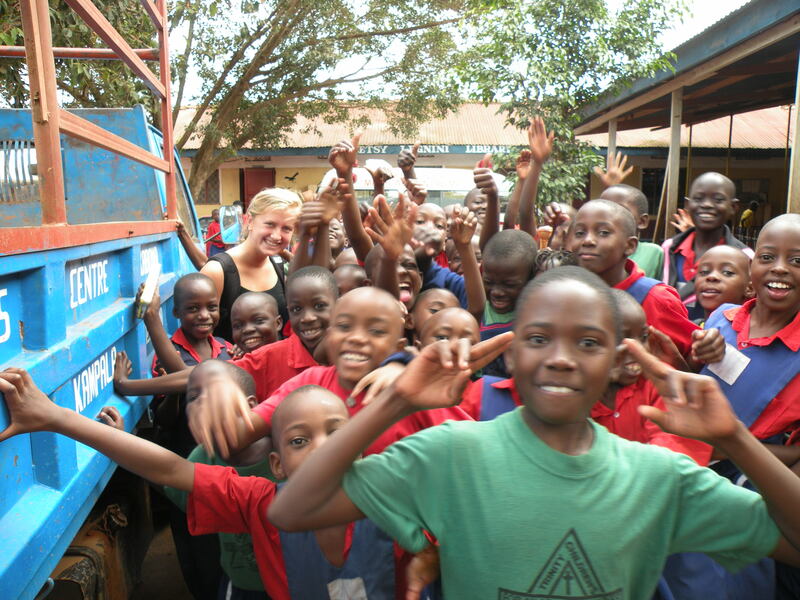 Maddie Brandenburger is a former development intern with Grameen Foundation and is involved with MFI Connect and the Nyanya Project. She recently reconnected with friends from GF at the Microcredit Summit in Nairobi. I’ve just returned back to Wake Forest University, where I am a junior studying economics and international development, after spending a week at the Africa – Middle East Microcredit Summit in Nairobi, Kenya. I feel more than ever, extremely enthusiastic about the pivotal role students are playing in the microfinance industry. We are in a time of economic uncertainty, but it is a very important point in modern history for young people to step up, as the entire world reevaluates the definitions and parameters of success and service. I was given an incredible opportunity and provided with a grant to attend the conference in large part because of the knowledge and skills I gained interning at the Grameen Foundation last summer. MFI Connect and Wake Forest examined my experiences with Grameen Foundation and had the confidence in me to fund the conference costs. MFI Connect was created by former Grameen America interns who identified the growing need of a resource for students wanting to engage in microfinance opportunities. Just one year old, MFI Connect boasts membership of 1000 members in over 60 countries and across 120 universities. It was MFI Connect who created the student delegation of 50 students from all over the world to attend the conference. My week in Nairobi proved to be an invaluable exercise in harnessing the combined power of intelligence and experience of microfinance professionals. The spirit of collaboration, the passion for progress, and palpable excitement in the conference tent is something I will take with me always, and try to call upon if I ever feel overwhelmed or unsure in such an evolving industry. I was surrounded by the best and the brightest in the world, and in a continent riddled with so much poverty and sadness, I felt nothing but hope. MFI Connect arranged for private sessions with Muhammad Yunus of Grameen Bank, Fazle Abed of BRAC, Ingrid Munro of Jamii Bora, Sam Daley-Harris of the Microcredit Summit Campaign and Hans Reitz of Grameen Creative Labs. Throughout the week I was able to reconnect with many of the GF staff members who I worked with last summer. 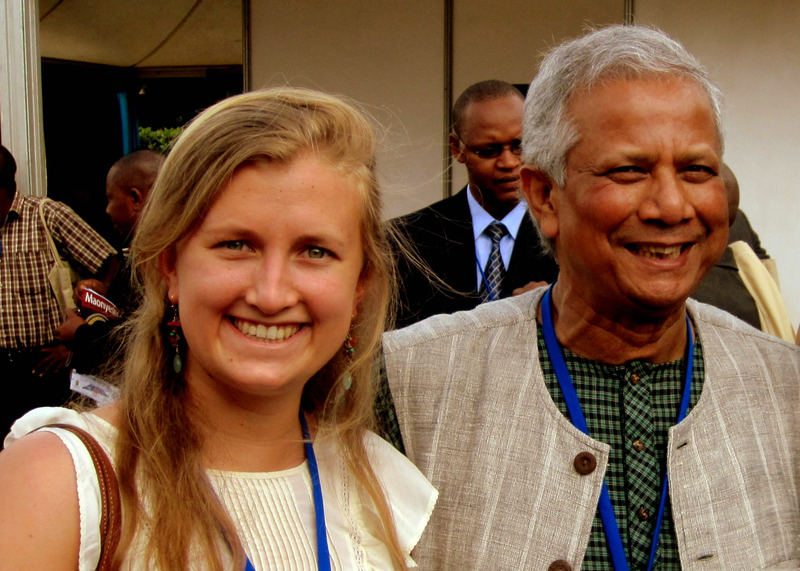 I had my first interaction with Grameen Foundation when I purchased phone minutes from the GF Village Phone women in Kampala, Uganda, during a trip in 2008. I traveled to Africa for the first time that summer after receiving a research grant to study the effects of foreign aid on urban communities. My experiences working at a primary school and medical center in Kampala fueled my desire to have a role in eradicating global poverty. I observed firsthand that micro level projects, such as the GF Village Phone program are producing the most sustainable outcomes because they address the roots of poverty and not simply the results. Upon arriving back in the states, I researched the Grameen Foundation’s work with technology and microfinance and gathered the courage to apply for an internship. Last summer I worked with the Development team as the Corporate Relations intern in Washington, DC. It was a privilege to work with such an intelligent and motivated staff, all of whom encouraged me to continue educating myself as much as possible and to gain field experience. This summer I will return to East Africa to Kenya, Tanzania and Rwanda on a research scholarship to study microfinance and microsavings projects in both urban and rural environments alongside a Wake Forest professor, Mary Martin Niepold, who started the Nyanya Project in 2007. I have decided to extend my research to incorporate a three week stay in Jamii Bora’s Kaputei eco village after meeting many of the wonderful borrowers and learning about their program implementation throughout this week at the conference. I feel extremely grateful for my internship at the Grameen Foundation, which gave me direction, furthered my drive, and gave me the confidence to become a future leader of the industry. This entry was posted on April 14, 2010 at 8:07 pm and is filed under microfinance, Travelogue. You can follow any responses to this entry through the RSS 2.0 feed. You can leave a response, or trackback from your own site. OK, so you where there. You observed poverty at levels inspired interest in micocredit as an intervention tool, but what did you do to further the cause of social lending? i would like to contribute to programme as a volunteer. It is wonderful to see our students involved in altruistic matters.